See a lot more snapshots and movies. TrakEM2 video tutorials for users. 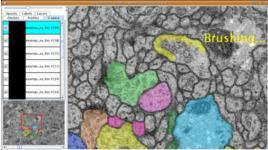 Segmented ssTEM stack of Drosophila neural tissue, with images, XML, and pre-exported multi-section TIFF files with labels. Download latest Fiji with TrakEM2 or go to menu "Help - Update Fiji". Pull source code from the git repos. Stay up to date with Fiji. TrakEM2 class diagram for programmers. Milestone release: 1.0a. TrakEM2 is now feature complete. New contextual menu items "Patch - Open image" and "Patch - Open original image". Create subproject can ignore hidden images. Fix bug #351, related to exporting flat images without mipmaps. Fix error in removing Stack ZDisplayable instances. Fix error in "Save as", didn't allow for ".xml.gz" extension. Fix error in duplicating Patch. Fix for long-standing error in the form of lack of undo upon clicking and dragging a tile very slightly. Layer alignment and montaging dialogs are split into multiple consecutive dialogs. Removed "Integral area averaging" as a possible mode for mipmaps, makes no sense anymore and "Area averaging" is better and faster. Coping with changes in the ImageJ API regarding ByteProcessor.setMinAndMax, which is no longer destructive. Some speed-ups by using the API better. New filters NormalizeLocalContrast (sort of like CLAHE but accelerated with integral images), DefaultMinAndMax, ResetMinAndMax and EnhanceContrast. 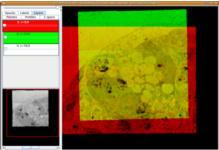 Deal with potentially null FileInfo, adapting to changes in the ImageJ ij.jar library. "Prepaint" display property is disabled by default. Does no longer make much sense to have it. Long list of big and small fixes. See the git log. 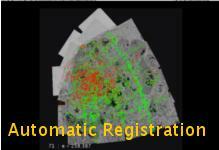 Thanks to Stephan Saalfeld for the final touches to his image registration library and graphical interface! The Open Connectome Project is hosting an ssTEM image data set of 1200 serial sections from Bock et al. (Nature 2011). The data was analyzed with TrakEM2, using the Treeline and Connector data types to reconstruct neuronal arborizations and their synapses of the mouse visual cortex. The image data set is deployed online with CATMAID, the Collaborative Annotation Toolkit for Massive Amouts of Image Data. TrakEM2 is able to export its image data set to CATMAID with "Export - Flat Image" (with "For web"), and Treeline, AreaTree and Connector instances are currently exported with custom scripts. Compile from source -- has lots of .jar file dependencies. Requires ImageJ ij143a or above. See the TrakEM2 Installation How-To for all details and required additional files. Semantic segmentation editor: order segmentations in tree hierarchies, whose template is exportable for reuse in other, comparable projects. Model, visualize and export 3D. Work from your laptop on your huge, remote image storage. Work with an endless number of images, limited only by the hard drive capacity. Dozens of formats supported thanks to LOCI Bioformats and ImageJ. Import stacks and even entire grids (montages) of images, automatically stitch them together and homogenize their histograms for best montaging quality. Insert layer sets into layers: so your electron microscopy serial sections can live inside your optical microscopy sections. Run any ImageJ plugin on any image. Measure everything: areas, volumes, pixel intensities, etc. using both built-in data structures and segmentation types, and standard ImageJ ROIs. And with double dissectors! Visualize RGB color channels changing the opacity of each on the fly, non-destructively. Annotate images non-destructively with floating text labels, which you can rotate/scale on the fly and display in any color. Montage/register/stitch/blend images manually with transparencies, semiautomatically, or fully automatically within and across sections, with translation, rigid, similarity and affine models with automatically extracted SIFT features. 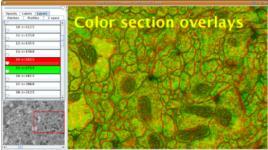 Correct the lens distortion present in the images, like those generated in transmission electron microscopy. Add alpha masks to images using ROIs, for example to split images in two or more parts, or to remove the borders of an image or collection of images. Model neuronal arbors with 3D skeletons (with areas or radiuses), and synapses with connectors. TrakEM2 has been written in Java as an ImageJ plugin, and contains a virtualization engine for seamlessly working with arbitrarily large datasets, limited only by your file storage capacity. Two independent modalities exist: either XML-based projects, working directly with the file system, or database-based projects, working on top of a local or remote PostgreSQL database. TrakEM2 is the design child of Rodney Douglas and Albert Cardona, with the help of the entire Institute of Neuroinformatics, University of Zurich / ETH, and has been implemented by Albert Cardona. Stephan Saalfeld and Stephan Preibisch, from Pavel Tomančák's group, have written the libraries responsible for phase-correlation, cross-correlation, scale invariant feature transform, and associated utilities such as proper, gaussian-exact image resizing and automatically multithreaded processing routines that adapt to the machine's available cores. Albert Cardona, Stephan Saalfeld, Johannes Schindelin, Ignacio Arganda-Carreras, Stephan Preibisch, Mark Longair, Pavel Tomancak, Volker Hartenstein and Rodney J. Douglas. 2012. TrakEM2 Software for Neural Circuit Reconstruction. PLoS ONE 7(6): e38011. Stephan Saalfeld,	Richard Fetter,	Albert Cardona and Pavel Tomancak. 2012. Elastic volume reconstruction from series of ultra-thin microscopy sections. Nature Methods, doi:10.1038/nmeth.2072. Stephan Saalfeld, Albert Cardona, Volker Hartenstein, and Pavel Tomancak, "As-rigid-as-possible mosaicking and serial section registration of large ssTEM datasets," Bioinformatics, 26(12), i57-i63 (2010), doi:10.1093/bioinformatics/btq219. Albert Cardona, Stephan Saalfeld, Stephan Preibisch, Benjamin Schmid, Anchi Cheng, Jim Pulokas, Pavel Tomancak, and Volker Hartenstein, "An Integrated Micro- and Macroarchitectural Analysis of the Drosophila Brain by Computer-Assisted Serial Section Electron Microscopy," PLoS Biology, 8(10), e1000502 (2010), doi:10.1371/journal.pbio.1000502. Schmid B, Schindelin J, Cardona A, Longair M, Heinsenberg M. "A high-level 3D visualization API for Java and ImageJ," BMC Bioinformatics 11:274 (2010). doi:10.1186/1471-2105-11-274. See the list of publications that cite TrakEM2. TrakEM2 would not have been possible without the continuous help from ImageJ's author, Wayne Rasband, and the economic support to Albert Cardona from both Rodney Douglas at INI and Volker Hartenstein (NIH Grant NS054814) at the University of California Los Angeles. We are also particularly grateful to German Koestinger for testing and extensive feedback, David Lawrence for his assistance in PostgreSQL, and also to Nuno da Costa, Rita Bopp, Lauriston Kellaway, John Anderson, Wayne Pereanu and Davi Bock for their input. 3D visualization and mesh-making by marching cubes have been possible thanks to Bene Schmid and Johannes Schindelin from Würzburg. Image stitching has been made possible thanks to Stephan Preibisch, and the web viewer thanks to Stephan Saalfeld, both from Pavel Tomančák's in the Max Plank Institute for Cell Biology and Genetics, Dresden. Please forward any comments and suggestions to acardona at ini phys ethz ch.